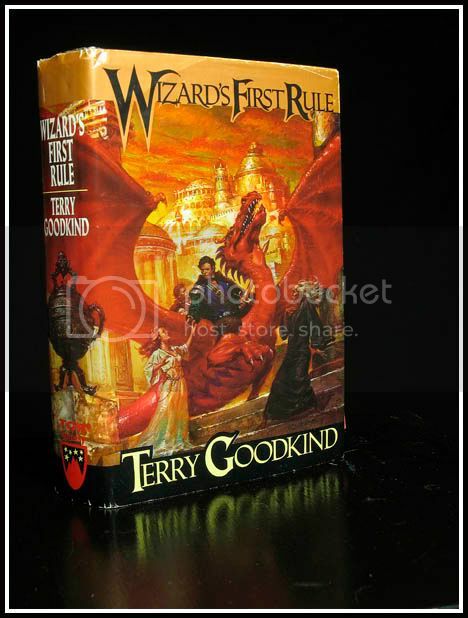 Wizard’s First Rule by Terry Goodkind. The first of the Sword of Truth books. This is an early edition. It’s so old that they list they next book’s title as Wizard’s Second Rule. THe title was changed to the Stone of Tears and the series become know as the Sword of Truth. There is a TV show based on the books called Legend of the Seeker. Seeker ( of Truth) being the title of the main character. This was written by admin. Posted on Sunday, August 2, 2009, at 11:06 pm. Filed under Photography. Tagged Fantasy, Studio. Bookmark the permalink. Follow comments here with the RSS feed. Both comments and trackbacks are currently closed. Love the angle and the reflection of the author’s name. The colors just jump out at you with that black background! Great shot!